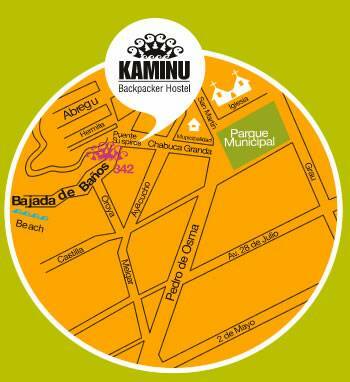 The Kaminu Backpacker Hostel is located in the historic bohemian district of Barranco. Though newly renovated, our house is a charming old building within the pedestrian area of Barranco, that leads you directly to the beach. The District offers a broad range of bars, live music, artistic shows, restaurants and scenic walks and is located near the popular touristic area of Miraflores with a lively night life. Our clean and comfortable rooms are styled in different types and we will prepare them with as many beds as you want to. So you can enjoy being by yourself in a private double or meet with people in a dormitory up to ten beds. We have public bathrooms, with new facilities and all with 24 hours hot water. Also you will find a common room where you can meet people and share you travel experiences. The common room features a cable TV, DVD, free wireless internet service, private lockers and a fully equiped kitchen. You can also enjoy a lovely large roof-top terrace with table football, board games, BBQ and a garden to sunbath. The Kaminu staff will provide all the information you need for a wide range of tours and will arrange everything you like to during your stay at Kaminu. Our rooms are all different styled in the colours of the parts of the country (Selva, Sierra, Costa). The high topped walls guarantee a good ventilated air and all of our 1. 5 place beds have orthopedic matresses for a good rest. Located at the south end of Lima, Barranco offers a base in a relaxed atmosphere to explore one of the most interesting cities in South America. The neighborhood features lots of art galleries, gift shops and restaurants and is one of the most visited destinations for a quite sunday afternoon walk. Anyhow it´s just a short ride to the touristic places of Lima, like the old town, the national museum and many more. Our house is located in the district of Barranco in the south of Lima, just a short taxi ride from the popular area of Miraflores. Take a taxi or a minibus to Barranco and ask for the beach. The pedestrian crossing will lead you directly to our hostel. For additional information how to find us look at the attached map.